The underlying message, of course, is that we can’t defuse anger with anger, fear with fear. We can only defuse anger and fear from a calm countenance… from a place of inner peace… a place of love. True enough, at least in the deepest spiritual sense… but how does that really work for us here in this noble-savage world? If a bank robber demands all the money in the till, the teller doesn’t offer him the vault. If a young woman is raped, she’s not encouraged to submit to more. When Nazi Germany was busy conquering Europe and killing millions of people in death camps, it wasn’t flotillas of love that streamed across the Atlantic to defuse the atrocities. American troops were driven by determination and, yes, by hatred and fear toward Adolf Hitler and toward the brutality embodied by his regime. We inhabit a material world in which many of our physical laws fly in the face of spiritual law. Light and darkness cannot coexist In the worlds of spirit. They separate from each other like oil and water. Love ascends to a finer, lighter vibration, fear to a lower, denser vibration. But in human society here on Earth, darkness coexists stubbornly with light… hatred with love. Men of peace are sometimes engulfed in mayhem… like monks surrounded by a riot… so that sometimes it seems necessary for savage forces to step in to fight fire with fire… to drive out aggression with more potent aggression… all with the intent of restoring a state of peace in which even monks can flourish in society… outside the protective walls of a monastery. But is savage behavior really necessary? Can savagery be overcome only by greater savagery here on Earth? Or can we really commit to a noble bearing while living in this noble-savage world? If we do, what are the rewards and consequences of that commitment? If we’re loving and trusting, will we be a force of peace, or will we simply be ground up by the savage forces around us? Assuming that a noble disposition, born well and carried with courage, really can overcome the savagery around us… are there techniques that we can learn? If so, could those techniques be built into a political system in such a way that a nation like the USA could be a noble force in the world whose policies defuse international tensions and wars… rather than provoke them? Or are we bound by the laws of this noble-savage world to promote world peace only by being more savage than those around us? In honor of Martin Luther King and the legions of men and women of peace who came before him, that’s what I hope to figure out this week. 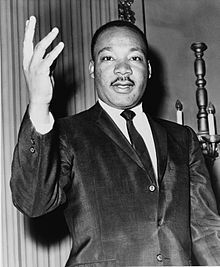 This entry was posted in Inner exploration, Politics and Economics, Society and ethics, Spiritual realms and tagged contending with savage behavior, martin luther king, peace. Bookmark the permalink.